I was born and raised in Brazil and started my career in advertising at 19, working at São Paulo based agencies. At 22 I bought my first pair of winter boots and moved to New York to join JWT. There I was selected as 1 of 50 High Potential employees, from a network of more than 10,000 people. The program aims to recognize, reward and train top talent for future leadership positions. I’ve been featured on Business Insider’s list of the ‘30 Most Creative People in Advertising Under 30’ in 2012, 2014, 2015 and 2016. 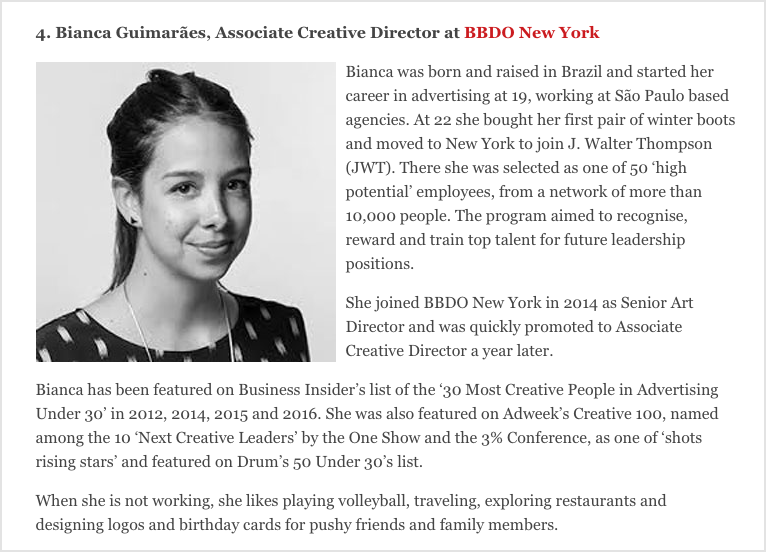 I was also featured on AdWeek's Creative 100, named among the 10 'Next Creative Leaders' by the One Show and the 3% Conference, as one of Shots Rising Stars, featured on Drum's 50 Under 30's list, on MarComm’s Magnificent Advertising Creatives and most recently featured on AdAge 40 Under 40’s list. My anti-bullying PSA In Real Life was nominated as Outstanding Commercial at the 2018 Emmys. When I’m not working, I like playing volleyball, traveling, exploring restaurants and designing logos and birthday cards for pushy friends and family members. on the stand-out mobile moments and inspirations. & Reality in Getting a Job in Advertising. Workshop at the AWNY Career Conference at FIT. Facebook Live interview about winning work.